Ah those loveable Chicago Cubs! One of the most futile franchises in professional sports may not raise eyebrows on the field but inadvertently managed to raise some issues regarding gays and sportscasting. On June 29, for the first time in 82 years, the Cubs did not schedule a Sunday game at Wrigley Field. 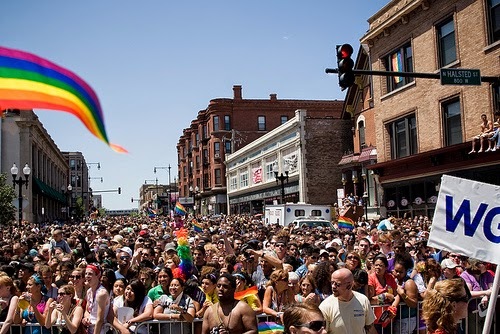 The reason for this anomaly is that traffic congestion and gridlock would cause a commuting nightmare near the venerable ballpark due to the fact Chicago is holding its annual LGBT Pride parade in the area. There was no further explanation provided. It wasn’t described as a “gay pride parade” or maybe an “LGBT pride parade,” just a generic, non-controversial “pride parade.” Santangelo did admit he understands the reason for not scheduling the game but all he offered was his lament that he cannot spend a Saturday night out in the Windy City. The avoidance by this broadcasting duo to impart the true reason for the non-scheduling of the Sunday game came as no surprise given that they never mentioned, to my knowledge, the semi-annual Night Out with the Nationals events. It was almost like he wanted to say “gay pride” or something like that but caught himself as if he was about to drop the “f-bomb.” It may have been an equivalent the way he paused. At least the word “pride” was used during the week and the hope that most people would be sufficiently knowledgeable so that the dreaded “g-word” would not have to be uttered. The Orioles telecast on Sunday presented another opportunity. But instead of chalking up the scheduling matter in Chicago as some form of pride event, Orioles broadcaster Gary Thorne threw “pride" under the bus. He avoided it altogether referring to the traffic snarls being caused by a Wrigleyville parade. Good gracious! Famed sports broadcaster Howard Cosell always believed that people in that profession are journalists and should report events factually and truthfully: "telling it like it is," he used to preach. The reluctance to utter "gay pride" by these announcers failed the Cosell test. One cannot draw any conclusions from this nonsense because we don’t know what the producers want their announcers to say or avoid saying. Nonetheless, it demonstrates that if the subject of a gay baseball player surfaces for whatever reason, there is still discomfort in the booth, and that’s something to which we should pay attention. Pride became the hottest topic in the two months leading up to the annual event. When is it going to take place? Why did it move? What about the block party? etc., etc., etc. It’s not that these aren’t legitimate questions. They are. Pride has been growing for years and more of the community has either participated in the festivities or are at least aware of Pride. Much of the uncertainty for this year’s edition can be attributed to the GLCCB, who has run Pride for over 35 years, for being slow out of the gate in disseminating the information that would have quelled most of the questions and suspicion. However, logistical issues, such as delays in permit requests and other requirements that are not visible to the general public but are essential in carrying out this large enterprise, prevented an early release of the information. It wasn’t that they were deliberately trying to perpetuate a mystique. One of the complaints raised had to do with the move to the Artscape area from the familiar Eager and Charles locale that had been the venue for the block party for over a decade. This was not a result of some sinister plan; it was out of necessity, and it wasn’t a last minute decision either as some suspect. Former executive director Matt Thorn announced to the GLCCB Advisory Committee last July—merely a month removed from the 2013 Pride—that the Center was considering a move to the Mount Royal area where Artscape takes place. Therefore, the move had been contemplated for quite a while. 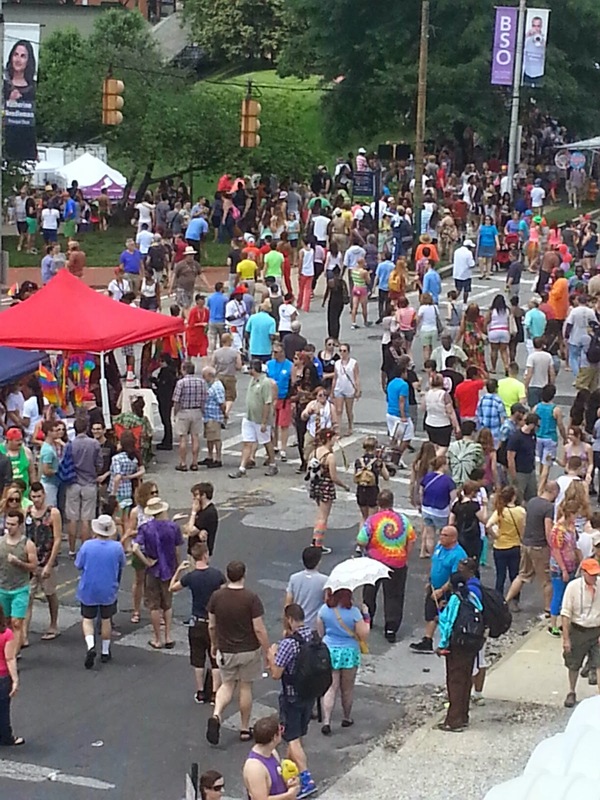 Recall just days before Pride last year the controversy led by the City Café’s concerns regarding underage drinking and sanitation issues at the block party. The GLCCB complied with the request or demand depending on how you look at it that the block party would begin at Morton and Eager—a block away from the City Café—restricting the celebration to an even smaller area. No doubt, the resulting brouhaha propelled the Center’s leadership to consider alternative sites. Of course, the rumblings about the move to Mount Royal followed. “It lacked the celebratory nature we’re accustomed to,” said one. “It was too organized,” said several. Those who like to consume a lot of alcohol and act “trashy,” as one put it, objected to the new venue. Though alcoholic drinks could be purchased at two beer gardens, customers were confined to the fenced-in areas. Some said they would never participate again; others said that they didn’t attend this year because of the changes. What’s being overlooked here are the countless members of the community who avoided past Prides because of the mayhem at the block party and who favor the change. The previous block party site was simply too crowded. Vendors lined up on both sides of Eager St. narrowing the street further. Some folks plunked down lawn chairs on the sidewalk that impeded the flow of foot traffic even more. I was bothered, as were so many others, that navigating through the block party in the past was nearly impossible. Few places to sit and little shade available made the experience worse. Thus, you can count me in as one of those who were happy about the move. Am I completely satisfied about this year’s Pride? No, but I give the Center high marks for attempting to run a major event for the first time in a new space. With some tweaks to improve the operation, Pride should be enjoyable for years to come. I do say, however, that the second day should have remained at Druid Hill Park. It was a good location to enjoy the laid back essence of the day, relax and have a good time. As a contrast to the frenetic block party, it attracted more families to the event as well. Having both days’ celebrations at the same place should be reconsidered. It was essentially more of the same on both days with some minor changes, yet an argument could be made that people who could not attend on one day could do so on the other. You can also argue for a single one-day celebration if the park is not an option. Asking less affluent LGBT groups or non-profits to pay higher fees for a space and requiring a two-day commitment if they choose to participate was ill-advised. The vendor roster became too commercialized, too corporate and priced out these smaller yet valuable organizations. The beer gardens should have tables and chairs as most similar set-ups do. Standing around in a pen drinking looks like people standing around in a pen drinking. Better access to the beer garden near the Main Stage is desirable, so the hillside, which was packed on Saturday, needs a pathway to the beer garden site. Also, more security—either by the GLCCB or the police—is needed towards the end of the Saturday event to discourage scuffles at closing time. It’s a wider perimeter to protect at this new site. I am certain there are other areas of improvement, but these come to mind. I give the GLCCB kudos for its overall administration of this year’s Pride and its desire to keep it fun and manageable. This organization is comprised mostly of volunteers so cut them a little slack. 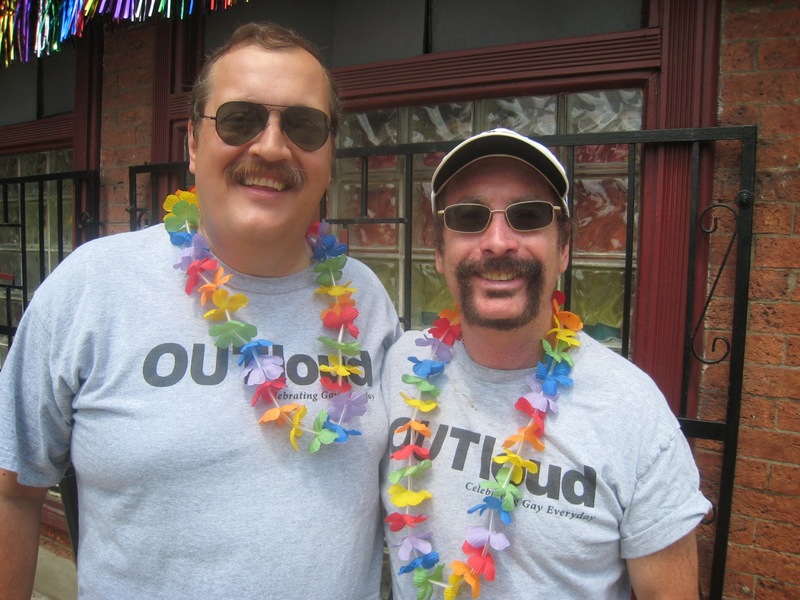 They had to endure a move to a new headquarters and a change in the executive director position all during the months leading up to Pride. They still carried it off and needed to since this is the GLCCB’s most significant fundraiser each year. To its credit, the Center will welcome community input on this past event and plan for next year’s during town hall meetings to be scheduled in July. The operation of Pride will never reach a full consensus throughout our communities. But the move is a good beginning to build on. If you never contemplated your purpose in life, raise your hands. Not that many rose I see. Identifying one’s purpose in life is the central theme in Avenue Q—a clever, funny, poignant and uplifting story of young adults navigating their way through real-life’s unforeseen challenges to fulfill their dreams. The satirical musical, currently playing at the Olney Theatre Center, also has its raunchy, racy and potty-mouthed moments. 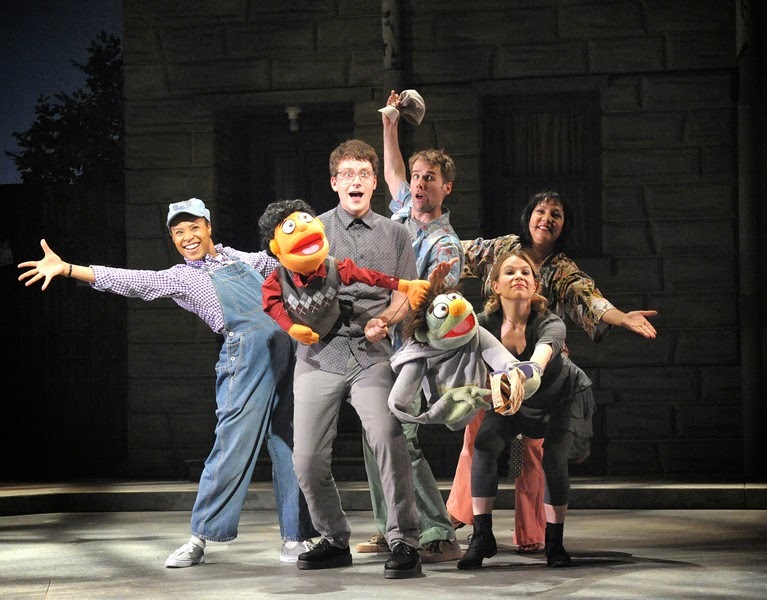 In a unique device for musical theatre, Avenue Q uses puppets as part of the storyline. 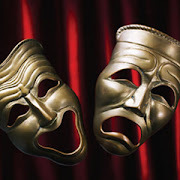 They combine the joy and brashness of those loveable characters seen in PBS’ Sesame Street from which Avenue Q’s characters were inspired and parodied by Robert Lopez and Jeff Marx who wrote the music and lyrics with the latter having interned at the program earlier in his career. The irony is that the characters represented in Avenue Q’s puppets deal with adult themes contrasting with those on the children’s TV show Sesame Street. The book was penned by Jeff Whitty. LGBTQ Pride for many in today’s generation means an opportunity to party and celebrate. Sadly, many don’t even know what they are celebrating. No joke; they don’t. They are ignorant of the past and what their elders had to overcome to reach a point today when there is actually something to celebrate. Not that things are perfect, but life is a whole lot easier today for those who are gay, bi and lesbian. Not so much yet for transgender folks though improvements have begun and should continue, albeit at a slower pace. Progress won’t fully occur until what it means to be transgender is more understood by the masses. So every year at this time I reflect on the meaning of Pride. Am I proud that I’m gay? Of course not. It’s not an accomplishment. It’s nothing I worked for where I succeeded in becoming gay. I’m no more proud of being gay than my being left-handed or that I have brown eyes. As in the case of these other traits, it’s who I am—for better or worse. When the notion of “gay pride” was formulated, it followed the Stonewall uprising (45th anniversary this month) whereby people who have been oppressed by the police, by the Mafia bar owners, by society in general took a stand and fought back. It wasn’t so much that people were proud they were LGBT but that instead they were fed up at being shamed for being who they are. I was too, but it took me much longer to summon up the courage to find my path. In fact, way too long. Like many in my generation, I felt shamed by society because I was gay. As I was compelled to hide in the closet, I was not aided by support groups to assure me that I am not alone. There were no such things like the Internet to keep me informed. A paucity of books on the subject. No social media to establish connections. Nothing. I could never think of disclosing my sexuality to my family. I never shared this aspect of me with my friends, even my close friends. I always felt pressure to do the “straight” stuff socially, especially during my college years, and it was like trying to write with your opposite hand. While I had a nice job, I could never come out; there were no employment protections. When I was drafted into the Army, I obviously couldn’t reveal the fact that I was gay, yet ironically it was during that experience I came out. By coming out I don’t mean broadcasting publicly my sexual orientation. Rather, it was the self-realization that this is who I am; I’m no longer deceiving myself thinking and hoping that it was a “phase” and soon I will be like everyone else. I patronized gay bars after being told where they were in NYC by the soldier with whom I had my first gay sexual experience. Even then I was cautious and peeked around before I went in to ensure that no one I knew witnessed my entering a gay establishment. When I moved to the Baltimore area in late 1977, still closeted, I was a little more open especially at work but not much. That is mainly due to the fact my section contained other gays and lesbians. I still could have been fired and could have been evicted from my apartment. Lord knows my neighbors had to suspect! I began writing for the then Gay Paper in 1980 but declined to spell out my last name in the bylines for a while. Then I grew a pair and reasoned that if anyone happened to see my name in the publication, the question begs, what made you pick up something called The Gay Paper? I already had met Bob Ford by then who was also in the closet. We attended Pride events each year, but were cautious not to be caught in the lens of the TV news cameras during the time such events were considered newsworthy by the mainstream media. Gradually, I summoned up the courage to liberate myself. I became much more comfortable with who I am, and having Bob at my side during this journey has been key. I made sure my family knew the truth, and they accepted Bob and I unconditionally. My newspaper bylines contained my full name as did the many letters to the editors of a number of publications. I was a little more out at work but still pretty private to most people even though they suspected or assumed I was gay. The single most dramatic turn occurred on July 23, 2009 when I married Bob in Provincetown, Ma. After 29 years together, I think it was time—especially because I loved him so much (and still do), it was legal in that state, and there were rumblings at the time Maryland was going to recognize it. When we returned I posted a notice on Facebook, and my neighbors, former co-workers and other friends applauded us and wished us well. Not that they were surprised but they like us and were sincerely happy for us. It was the turning point with a lifetime of weight lifted off of my shoulders and for Bob as well. Coming out is what we should be proud of. That’s where the pride is—the removal of any shame for being who you are. Yes, Pride is equated with drinking and reveling. But coming out and seeing the advances myself and other LGBT folks have experienced is what really defines Pride. Tanner Medding as Canvas (L.) gets "inked"